Myotonic dystrophy is part of the group of muscular dystrophies. It is the commonest inherited muscular dystrophy and has a profound effect on individuals who are diagnosed with the disease and their families. It is present for many decades of a patient's life but, unlike the other dystrophies, it also affects the organs in the body, making this a very distinctive disorder, and a very troubling one for those close to it. of myotonic dystrophy, and additional coverage of the new approaches to therapy and management of the condition are also included, as well as comprehensive discussion of the recent on-going worldwide research. 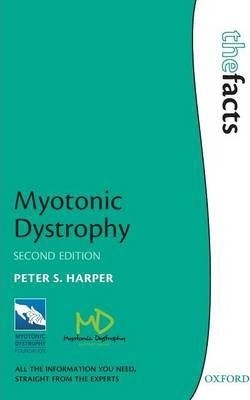 New to this edition are 'Key Facts' at the beginning of each chapter, 'frequently asked question' boxes, and up-to-date contact details for worldwide myotonic dystrophy support groups. Peter Harper is a University Research Professor in Human Genetics at Cardiff University, Wales. He is a member of the UK's Advisory Committee on Genetic Testing, and has a long-standing research interest in inherited neurological disorders, especially Huntington disease and Myotonic dystrophy.